TOPEKA, Kan. — In a special exclusive interview with 41 Action News on Monday, Kansas Gov. 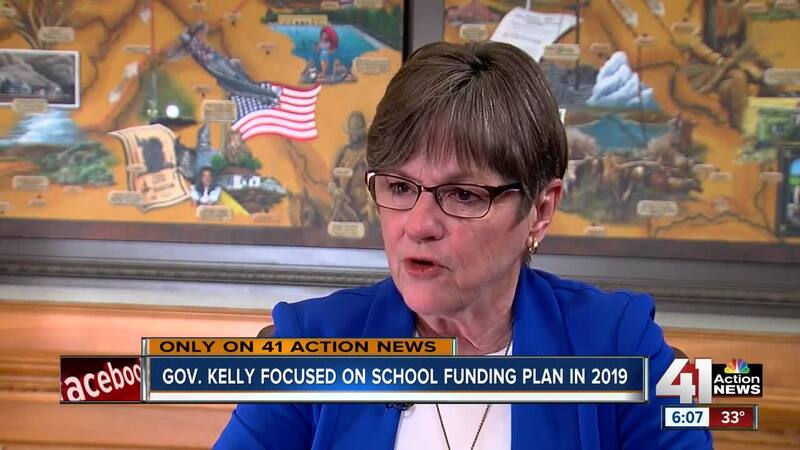 Laura Kelly said controversy over school funding that has plagued Kansas for years would hopefully come to an end soon. State conservatives have been at odds with the Kansas Supreme Court over how to fairly and adequately appropriate funding for public schools. Following her inauguration one month ago, Kelly has called for an over $90 million boost to the funding increase the state approved last year all for education. According to Kelly, her proposal would lead to an end to the battle with the state court justices. Kelly’s term as governor comes as the state continues to deal with the legacy of tax cuts pushed by former governor Sam Brownback. With the state still dealing with fallout, Kelly said she hoped to help the state finally make full progress on school funding. During her inauguration speech in January, the governor used the spotlight to focus on compromise during her term. With the Kansas House and Senate both controlled by a Republican majority, Kelly said her experience as a state senator would help her work across the aisle. After witnessing the controversy with school funding over the last several years, the new governor now hoped to make the issue a thing of the past. “I think at the end of the day we’ll be able to come together and find consensus and move forward,” she said. With Thursday officially marking one month since Kelly took office, 41 Action News will offer coverage throughout the week of its exclusive interview with the governor.